I know basic about URL, URN, and URI; but little on their differences. The thing I can't understand is in a page like: http://www.bernzilla.com/item.php?id=100 which part is URL, URN and URI! URI is whole part but URL and URN?? An URL is a type of URI that identifies a resource via a representation of its primary access mechanism (e.g., its network "location"), rather than by some other attributes it may have. It is now considered incorrect to use URL when describing applications. Now is id an attribute? What about application part? Is PHP an application? URIs encompass URLs, URNs, and other ways to identify a resource. An example of a URI that is neither a URL nor a URN would be a data URI such as data:,Hello%20World. It is not a URL nor a URN because the URI contains the data. It neither names it, nor tells you how to locate it over the network. There are also uniform resource citations (URCs) that point to meta data about a document rather than to the document itself. An example of a URC would be an identifier for viewing the source code of a web page: view-source:http://example.com/. A URC is another type of URI that is neither URL nor URN. I can see given that diagram from wikipedia why you're asking though. 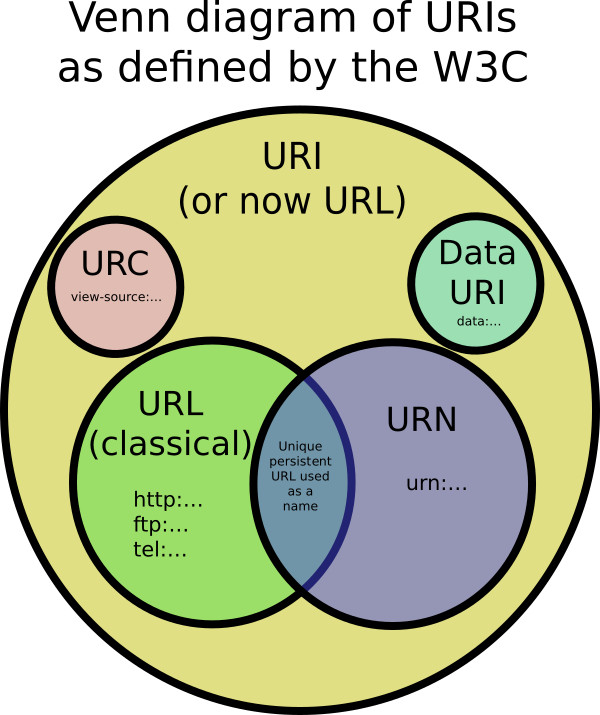 That diagram is saying there are two types of URI - URLs and URNs and the fuzzy bit in the middle is when something can be both. It is not the case that the URL you mention is composed of both a URL and URN part. http://www.bernzilla.com/item.php?id=100 is both a URL and a URI. Basically URIs are a superset of URLs and of URNs. There is some overlap between URLs and URNs as well. A URI identifies a resource either by location, or a name, or both. So any URL is a URI, any URN is a URI, but not every URI is a URL. Is incorrect to have the HTTPS version of the sitemaps.org URL in the xmlns sitemap schema? In a URI, what does the suffix “.do” stand for? Is there any SEO difference between /blog and /blogs?